Can a One Size Diaper REALLY Fit a Newborn & Toddler? Softbums Can! A lot of cloth diapers are called one-size diapers, but the Softbums Diapers truly is. Check out how this Softbums Echo cloth diaper system can fit a newborn as small as 6 pounds to a toddler that is 35 pounds. I received a Softbums Cloth Diaper to review. All thoughts are 100% mine. I’ve had lots of Softbums in our stash over the last 3.5 years of cloth diapering and I’ve reviewed them a few times too [see those reviews below], but it HAS been awhile since I’ve seen a Newborn Diaper, I seriously forgot how teeny tiny they are! That’s the very reason that I did a double take at the package when I pulled the diaper out. I thought that Softbums must be making a new newborn diaper and accidentally sent it to me instead of their One Size. Seriously, y’all! It’s been that long. Then I saw the OS and remembered just how tiny these diapers really get. Now, I’m not in need of any newborn diapers [two toddlers are all I need right now], but if you’re thinking of investing in a one-size cloth diaper system to truly last from birth to potty training, Softbums should probably be at the top of your list. The rise is smaller than the bumGenius Freetime above, pictured on it’s smallest setting. The main reason, though, that I love the fit of Softbums on an itty bitty baby, is the width between their legs. The Softbums is so trim that it doesn’t make newborns look like their legs are being pushed far apart. In fact, my friend Jenny says that Softbums, on the smallest setting, was too tight on her daughter when she was 3 days old. That, my friends, is a true one-size diaper. Wait. If it can get that small, just how big can it really get? The Softbums Echo Shell will fit from 6 – 35 pounds and I believe it. Look at the leg opening at about the largest setting of this One Size diaper. This diaper can certainly handle cute and chubby baby thighs! Softbums are also a brand where I don’t run from aplix. Their aplix seems to outlast some other major brands and doesn’t wilt after months of use. I also love the leg casings that this brand offers. 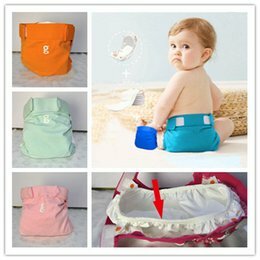 The fleece lining of the diaper extends out onto the elastic so it completely protects your baby from those awful red marks. Softbums are also completely unique in the way that they are sized. As far as I know, there are no other one size cloth diapers on the market that use the Slide2Size system. There are 2 pieces of elastic in each leg with a clear toggle on both. You simply pull the toggle up or down to… size up or down! 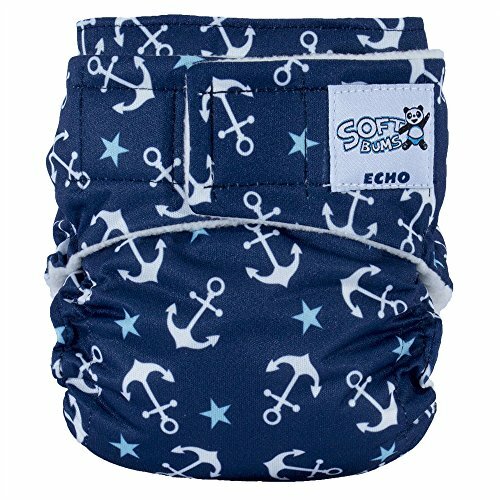 The Softbums Echo Shell, as seen above, is simply a shell or cover so this is technically an All-in-Two Cloth Diaper. The inserts lay right inside and can even snap in to keep them from wiggling around, if you have a super active baby or toddler. The Omni does a bit more – it acts as a Cover, AI2, AND a pocket, as you can put the inserts into the sleeve opening. I really prefer to use this system as an AI2, simply because I can use a couple of inserts and get 2-3 diaper changes out of the one diaper, by simply switching out the wet inserts. Both cover options offer a Snap and Aplix closure version. 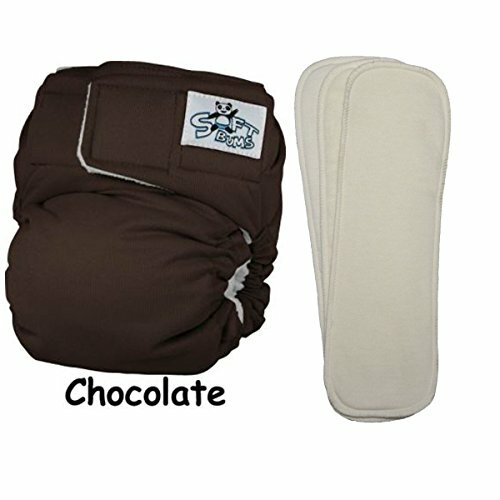 I do find, though, that since the Softbums covers are fleece lined, they can’t be re-used as much as PUL Diaper Covers. I usually just re-use 2, MAYBE 3 times because they tend to get a bit stinky if they get wet, which is probably because of the fleece lining. Although I do find that because they are lined with fleece, I get less leaks in this cloth diaper system. 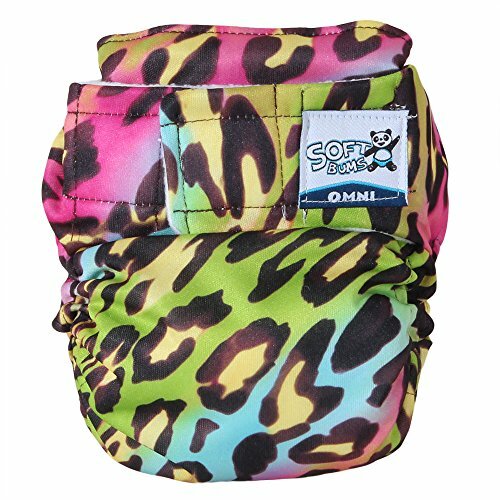 Softbums diaper shells come in a variety of colors and a few prints. The Finger Paint print that Moreaya is sporting above is retired at this point, but you can find a ton of cute and colorful prints on Amazon.com. You also have choices when it comes to Softbums inserts. Softbums offers the following insert types: Bamboo, Dry Touch One Size, Dry Touch Small, and Hybrid Disposable options. The Dry Touch inserts are made of microfiber and are actually quite absorbent. I definitely recommend the Dry Touch Small Pods for smaller babies and the larger pods for when your child is a bit larger, as the larger pods would be super bulky and not really necessary for a small baby. That’s the only part of this system that isn’t quite one-size. 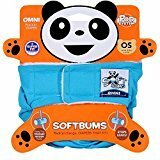 You can purchase Softbums diapers on their website and at a variety of cloth Softbums retailers, including Amazon ! Both Softbums Echo and Omni covers start at $21.95, without inserts. Amazon has a great 3-piece set that features a Shell and 2 Dry Touch inserts for $25.95. In true, All-in-Two style, Softbums inserts can be purchased separately, since you can reuse the shell a few times during diaper changes, and cost $4-$9 each, depending on size and material chosen. While I highly recommend Softbums diapers because of their true one-size system, I realize they aren’t the cheapest cloth diapers available. If you’re on a budget, you’ll definitely appreciate these tips and diaper suggestions for clothing diapering on a budget. I would love to get a few of these for my newborn niece! My sister is about to pop! Cute print! And that’s a great demonstration of the size difference, great fit! I would love to see pics of the Omni and Echo side-by-side. I’ve always been a bit confused as to the difference.